I am writing this note in the new ambience of our office headquarters in Santa Clara, the heart of Silicon Valley. After several years in Milpitas we have moved! I am happy to share with you as announced in a recent press release that Kovair and nSolutions have forged a partnership for enhancing Kovair ITSM Configuration Management DataBase automation with nSolutions Nova product line. This integrated product will provide customers with automated, ITIL-compatible IT Service Management with real time visibility and control of the IT infrastructure through NOVA. Please check out the March press release. In this issue, we have featured an article by Amit Dasgupta, one of our Engineering Managers. The article titled “Multi-edit List Interface – Support for in-place edit of Grid Field” explains the useful features of Kovair’s list interface. Continuing with our series of successful webinars, we are organizing yet another useful webinar on integration of best-of –breed tools with Visual Studio and TFS, on April 13 and 14. If you as a user or potential acquirer of these Microsoft tools are grappling with the issue of integration with other ALM tools you own, this webinar will show you a path. Registration links are provided at the end of the newsletter. Kovair Entity Framework supports several rich field types. Grid field is one of them, extensively used by our customers who love the power and usefulness of this field structure in capturing entity data. Grid field is a composite field structure that allows multi-row data input. Let’s take an example of Requirement Entity where multiple reviewers will review the same set of requirements and approve these individually. Kovair allows you defining a grid field attribute “Review Results” to record the review inputs like Reviewed By, Review Date, Review Decision (Approved/ Discarded), Review Score and Review Comment for each reviewer about each individual requirement. Reviewers can easily open up individual requirement, record their review feedbacks and see others’ responses based on access permissions. When the reviewer needs to review hundreds of requirements at the same time, opening up each requirement separately and capturing review outcome may be tedious, time consuming and inefficient. Kovair has come up with an effective list interface to work on hundreds of items simultaneously and deal with customer scenarios as above. Reviewers will be able to review multiple requirements at the same time and record their feedbacks from a single list interface using its useful features listed below. Displaying multi-rows -based grid field structure like “Review Results” within the list interface. Ability to record a new feedback row or modify a previous feedback just by a click. In-place editing of column data. Multiple row copy-paste based update using Excel like features- “Fill Selected” and “Fill Till Bottom”. Uploading images and files directly from the list interface just by a click. Rich-text editing with word-like formatting. Visual Studio and TFS Users: Work with these Microsoft Tools and Integrate with Others You Own! Development teams using Microsoft Visual Studio and TFS or planning to acquire them often need integrations with other development tools from various vendors like, Requirements Management – RequisitePro, Test Management – HP QC, Configuration Management – Perforce or Subversion. In this webinar, using Kovair’s Omnibus Integration Middleware Technology an actual demonstration of integrated Application Lifecycle Management will be shown. The webinar demonstration will include multi-vendor tools integrated with Microsoft Visual Studio and TFS. In addition, the unprecedented productivity enhancements of such integrations will be discussed. With these integrations, cross tools data visibility, traceability and impact analysis across tool boundaries are achieved, leading to consolidated reporting and dashboards for excellent management visibility and control. 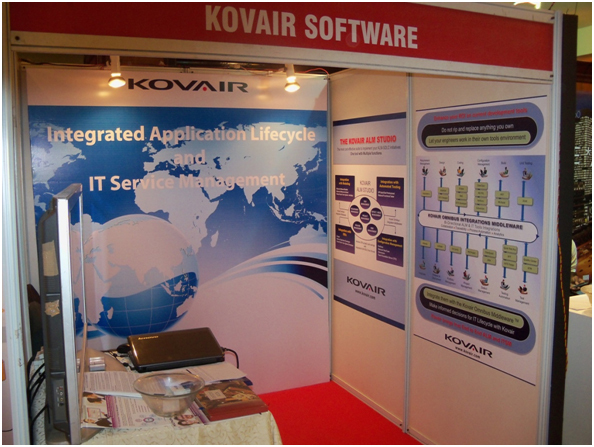 Kovair participated as one of the Sponsors at the Step-in-Summit 2011, the 8th International Conference on Software Testing at Bangalore, India on 17th & 18th February. This International Conference is a platform where professionals and practitioners come together to share their knowledge and leverage their experiences and practices on performing effective testing, using resources and test automation tools effectively. The pre-Conference tutorials were organized across four cities in India at Pune, Hyderabad, Chennai and Bangalore. The Conference at Bangalore was attended by 400-450 people each day. Our booth had a good number of visitors from different IT companies like Wipro, Mindtree Consulting, 3i Infotech, Symphony Services, Intuit, L & T Infotech, Cisco, Adea, Siemens, Tech Mahindra, Capgemini, NIIT Technologies, HCL to name a few. Most of the people showed interest in Integrations with multiple tools and wanted to know more about our Omnibus Integration Middleware technology. Our ALM Studio as an integrated product including Requirements, Testing, Issues, Release, Risk and Project Management was the other draw.